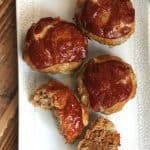 Turkey Meatloaf Muffins are a spin-off of the traditional meatloaf, but involves a much less frustrating process. Baking them in jumbo sized muffin tins removes the guesswork as these bake in only 20 minutes. A perfect weeknight meal! How to make tender meatloaf. 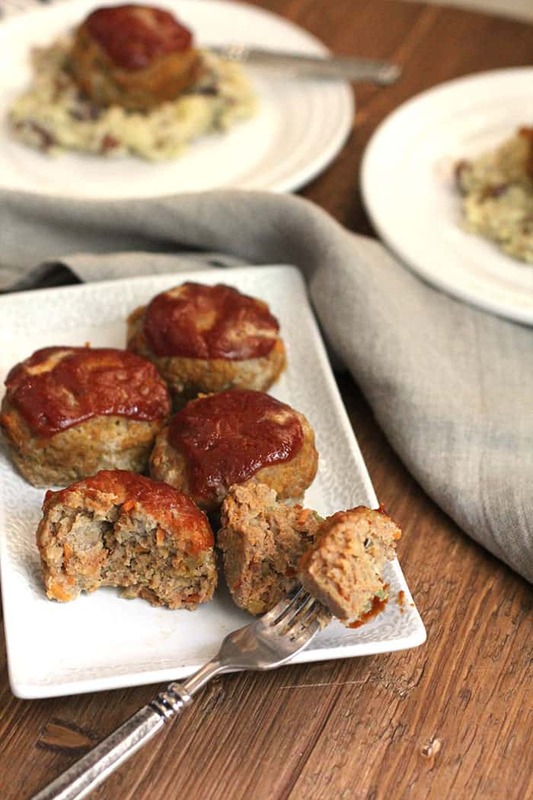 There are two reasons why my Turkey Meatloaf Muffins are more tender than traditional meatloaf. keeps baking time down, and thus keeps them moist. The onion-carrot-celery-garlic sauté adds even more tenderness. I love that these are done in just 20 minutes. Some easy swaps for you. 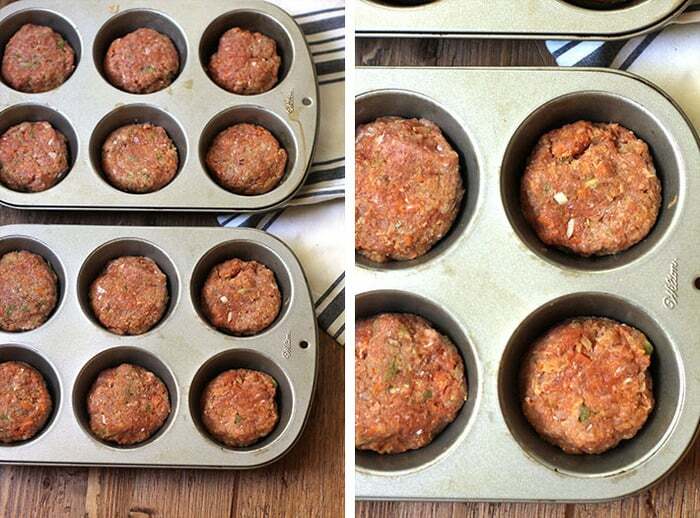 This recipe makes exactly 12 meatloaf muffins, and two muffins are a good serving size. Here are some recipe swaps for those that are wondering. 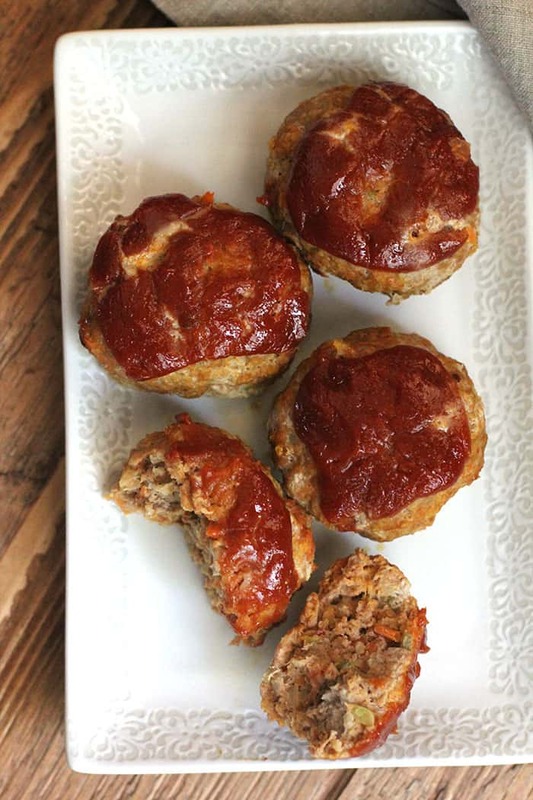 I used Jennie-O ground turkey plus some Hot Italian Turkey Sausage for these meatloaf muffins. 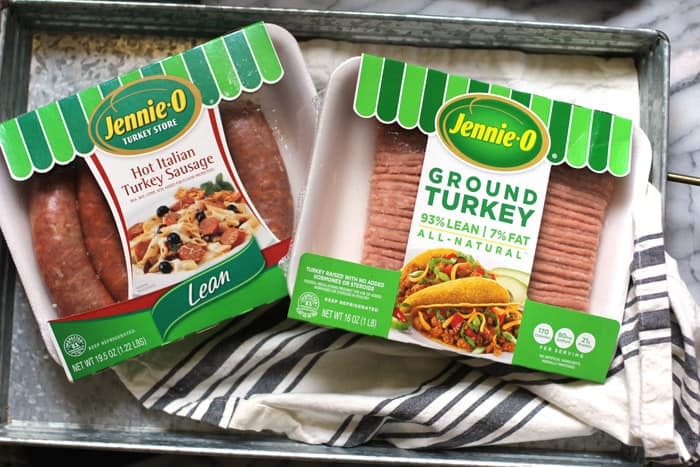 I love using ground turkey and often mix it with pork or beef. 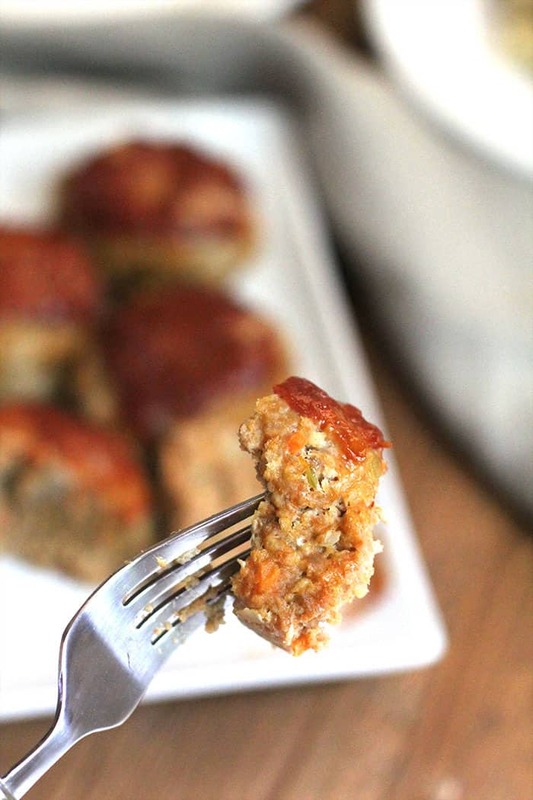 , you will probably get 18 smaller meatloaf muffins instead of 12. I served my Turkey Meatloaf Muffins over some smashed mashed potatoes. But you could also pair them with rice (like my Turkey Sausage Brown Rice), roasted veggies (like my Balsamic Glazed Brussels Sprouts and Sweet Potatoes), or a green salad (like my Arugula Caprese Salad). You can make the topping spicy…or not. The topping is “the icing on the cake” and involves a quick 3-4 ingredient mixture. I added some extra Sriracha to our meatloaf, and I LOVED it. If you don’t like spicy, just simply leave it out. Preheat oven to 400 degrees. Prepare large muffins tins with baking spray. 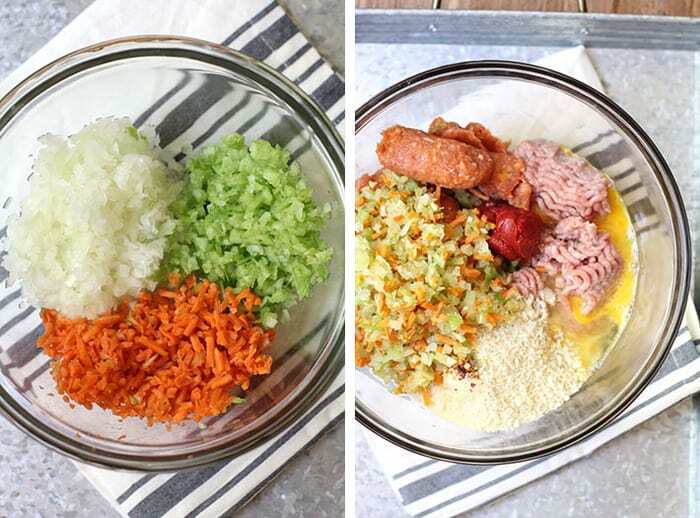 Prepare the vegetables by dicing in small pieces (or use vegetable chopper/food processor). Heat pan to medium heat, add olive oil, and then veggies. Sauté until soft, approximately 5-6 minutes. Set aside to cool slightly. In a large mixing bowl, combine turkey, all spices, tomato paste, Worcestershire sauce, bread crumbs, egg, and sautéed vegetables. Using your hands, mix everything gently, forming 12 large meatloaf muffins. Place in prepared muffin tins. Make topping by combining ketchup, mustard, brown sugar, and Sriracha. Spoon over the muffins. 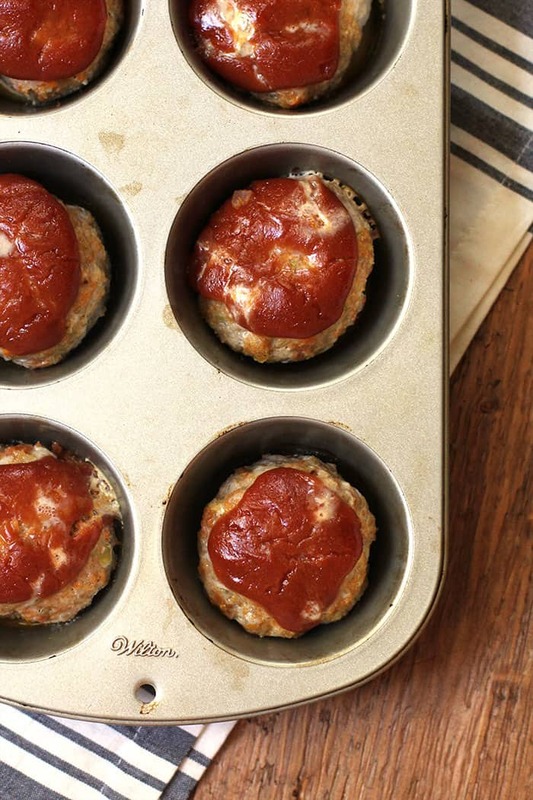 Bake meatloaf muffins for approximately 20 minutes, or until cooked through. Check for doneness by slicing into one meatball. Serve over smashed potatoes or with a side of veggies. You can freeze meatloaf muffins (without topping) for several months, wrapped tightly with saran wrap and placed in freezer bags. Check out the protein and calorie information for this awesome recipe. It does not get any better than this. Go for it and add the Balsamic Glazed Brussels Sprouts and Sweet Potatoes!